The 2017 NFL season has hit the quarter pole and the biggest surprise of the young season is our Buffalo Bills. Who would have thought that after four games the Bills would be 3-1 and have victories over such powers as the Denver Broncos and the Atlanta Falcons? Plain and simple, the Bills out played Denver a week ago but that game was in Buffalo at New Era Field. To beat a team like Atlanta on the road is what many will refer to as a “signature win.” With a little luck the Bills could very well be 4-0. Two weeks ago I was not ready to say the Bills are a playoff contender but now, seeing the way they have played and who they have beaten, they are without a doubt a team that has playoff possibilities. How has this happened? First and foremost the Bills play is a testament to new Head Coach Sean McDermott. He and his staff have done a wonderful job putting this team together and having them play at a high level. During the preseason, this team was mistake prone and looked sloppy. But once the bell rang for the regular season they have been excellent….on both sides of the ball! The one thing that has been apparent the last two weeks is offensive coordinator Rick Dennison and quarterbacks coach David Culley have done a remarkable job with Tyrod Taylor. They are putting together a game play that allows Taylor to play to his strengths. We are seeing boots and rollouts and they are letting Taylor play on the perimeter rather than keeping him in the pocket. Taylor is at his best when he is on the move and he does a much better job seeing the field. Through four games, Taylor is completing better that 65% of his throws, has five touchdown passes and only one interception. While he is throwing for less than 200 yards a game, the throws he makes have all been important throws at the right time. Early on, I was one of Taylor’s biggest critics but I have to admit I was wrong. He is playing winning football, and much of his success is a credit to the offensive coaching staff who are consistently using him the right way. As well as the offense is playing, the defense is even better. The remarkable thing is that they are playing in new scheme with many new parts. The whole defensive backfield is new and others on the defense are playing roles that they weren’t originally drafted for. Again, this is a testament to the coaching staff who have done such a fantastic job getting these guys to play together and play aggressive football. Shortly after yesterday’s game ended, I tweeted that if there was a coach of the year for the first quarter of the season, it had to be McDermott. 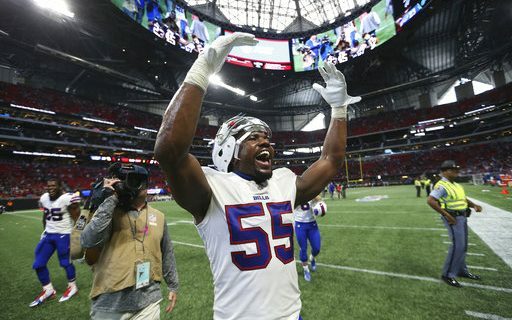 The Bills hit a home run with his hire and with the draft choices they have stock-piled for the future, the best is yet to come for Bills fans. As well as the Bills have played, the season is still only a quarter old and there is a lot of football still to be played. Most coaches like to play the season in quarters and if the team can go 3-1 each quarter they are obviously in the playoffs. The opponents for the first quarter were difficult but it doesn’t get much easier for the second quarter. Next week the Bills are at Cincinnati, who are coming off a big win in Cleveland. That game is followed by home games with Tampa Bay and Oakland, both strong teams from the NFC South and the AFC West. The quarter ends at the New York Jets, who have won two in a row and are much improved team since opening day. If the Bills can duplicate the 3-1 record of the first quarter they will be well on their way to their first playoff appearance in years. Here’s where you can find more from veteran NFL scout Greg Gabriel.